Santee, California, December 16, 2010, Michael A. Nace, Flight Nurse for Mercy Air part of Air Methods Coorporation and a nurse practitioner for Sharp Rees-Stealy Medical Group, has been recognized by Elite American Health Professionals for dedication, achievements, and leadership in emergency medical and trauma services. By drawing on his previous role as a commander and senior medical officer for the United States Navy, Mr. Nace has employed a strong work ethic for the last 25 years. As a Senior Naval Officer and nurse, he is responsible for supervising the staff in his department, and managing the cardiology and cardiothoracic units. Moreover, he administers emergency medical services, acute care and trauma medicine. An expert in flight and emergency nursing, Mr. Nace demonstrates fluency in prehospital, disaster and operational nursing. By exhibiting his caring nature and passion for his profession, he has been able to set himself apart from his peers and establish his competencies in the health care industry. He adds that his progression through the military, education, and knowledge of the world through his various travelling opportunities has also helped set him apart from his peers. Mr. Nace holds a Master of Science, with a concentration in trauma, critical care and emergency medicine, which he earned in 1999. His strong interest in the medical field prompted his involvement in the profession, and his ability to make a difference in the lives of others serves as the constant motivator to keep himself abreast of changes and trends. For Mr. Nace, the most gratifying aspect of his healthy career has been training young men and women to treat and care for those serving in the military and their families. Though he is retired from the U.S. Navy, he is still actively involved with mentoring the Navy’s medics and participating in veterans’ affairs. His career afforded him the opportunity to interact with people and work to make them better whether he is caring for them as a patient, teaching something new to someone, learning something new from someone, or putting a smile on someone’s face. He enjoys being able to empower people to make decisions where they don’t have to worry someone is going to make them a scapegoat. While serving in the U.S. Navy, Mr. Nace received several personnel decorations that include Meritorious Service Medal (2 awards), Navy Commendation Medal (4 awards), Army Commendation Medal, Navy Achievement Medal (6 awards), Army Achievement Medal, Combat Action Ribbon (2 awards), and numerous other unit and campaign awards. He has also been honored with a White House Letter of Appreciation and other national and international letters of commendation for his dedication to service. He is affiliated with the Baltimore Alumni of University of Maryland, the Emergency Nurses Association, the Alumni Association of the University of Cincinnati, the Air & Surface Transport Nurses Association, and Sigma Theta Tau International. Mr. Nace is also involved with voluntary initiatives with Rady Children’s Hopsital in San Diego. Mr. Nace started a new business in 2010 with his best friend called Lifeguard Medical Training for Patient Transport, in which they are dedicated to providing concise, realistic, and up to date en-route trauma transport training either on the ground, air or sea. For more information on Lifeguard, please visit http://www.lifeguardmedicaltraining.com.Michael A. Nace was originally selected for inclusion in Elite American Health Professionals in December, 2010. 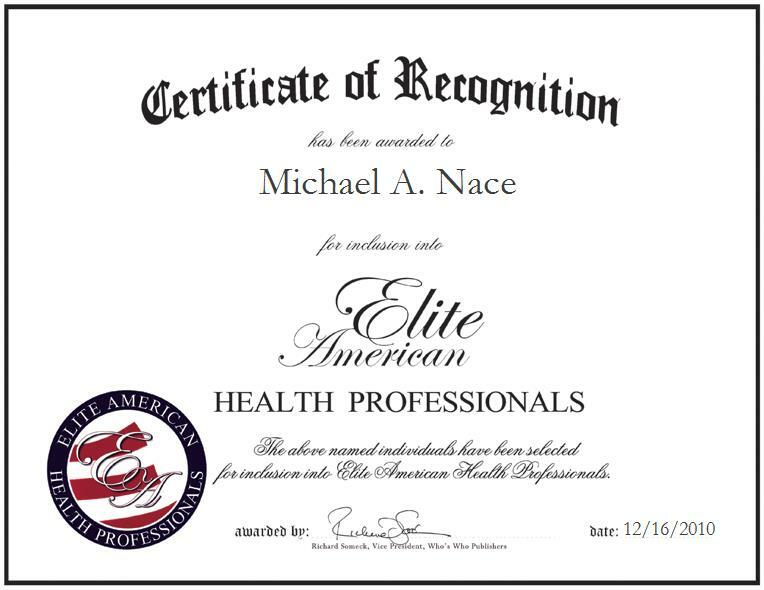 We are proud to be featuring Mr. Nace again in Elite American Health Professionals for 2012/2013.